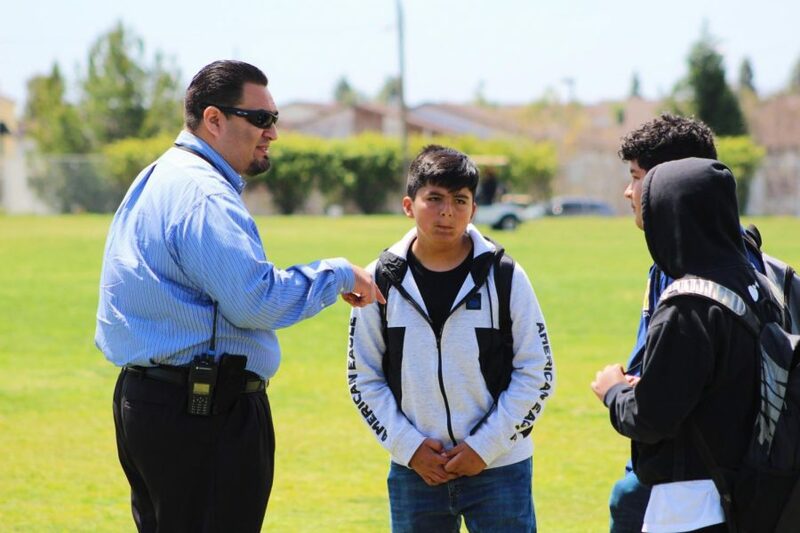 Assistant principal, Carlos Saucedo, tells a group of freshman to leave the field during a walk-out, while he had told others if they were on the field that they couldn't leave. During lunch and sixth period on Thurs., April 11, a group of around 25 students participated in a student-planned walkout to protest multiple issues, the primary one being Bonita Vista High administration’s response to a recent online threat of a school shooting. The students congregated in groups or pairs on the grassy fields near the back of the school, some playing cards while others sat and talked. Also present were Assistant Principal Carlos Saucedo, Ed.D, and two campus security guards on golf carts. They actively stopped the protesting students from leaving the field area during the duration of the walkout. “[I am participating in the walkout] because I felt that it was important that the school shouldn’t make us come to school, even if there’s a threat, because it’s possible for it to actually happen, and they’re putting our lives in danger,” freshman Alyssa Evans said. Evans found out about the walkout through social media, the same way many students spread the news of the shooting threat Sun., April 7. Two different students threatened to shoot others on campus on April 8 through Instagram. The student responsible for the second threat was detained on Tuesday, April 9 and claimed to have wanted to scare his peers. Many parents and students expressed concern and outrage at the administration’s decision to keep the school open on Monday with heightened security. BVH administration informed families of this decision through an email on April 9 after the Chula Vista Police Department deemed the threat “unsubstantiated.” As of now, the individual responsible for the first threat has not been detained. “I feel like [administration is] just trying to try to quiet down the situation as much as possible. I’ve talked to a lot of [my friends], they all pretty much share the same discomfort that I do with the school. We feel like BVH should have called off school that day because none of us felt safe here on campus,” one of the walkout organizers and sophomore Andre Ghashghaee said. Walkout participant and junior Adriana Estrella expressed concern that the school valued money over the safety of students, arguing that the school refrained from cancelling school on Monday in order to get paid for the attendance of students. However, no confirmation has been made that the school would have lost money by alternatively cancelling school. Ghashghaee decided to organize the walkout because he wanted to show BVH officials that he didn’t appreciate how students and parents weren’t notified with more information yet they were still expected to attend school on that Monday. In addition, he wanted to send the message that students are frightened. “Me and my friend we’re talking about organizing something to show the school we [were] having to fear for our lives. We come to school to learn, we shouldn’t have to worry about maybe not going home after school,” Ghashghaee. While students like Estrella and Evans hoped to get their message of concern and frustration to BVH administrators through their participation in the walkout, another student claimed to be there to “chill” and avoid their sixth period class. “[The administration] should warn us when its okay to come back to school and let us all know what’s happening so we can know we’re safe coming here. I’m going to be honest, I know some people that aren’t here because of that,” walkout participant and freshman Kailah Walser said. Walser came to the soccer fields instead of her sixth period class to protest for national gun control, in addition to concerns at the school level. Freshman Rosario Ortiz was also primarily participating for that reason. While a possible second walkout was advertised for the week of April 15, Evans, Walser, Estrella, Ghashghaee and freshman Jose Luis Martinez were all unaware of the plans.